Al Boom Tourist Village is a blend of different venues, as here visitors can arrange their weddings, parties, meetings or conferences as well as having a fun day out by booking one of their cruises. In addition to this, there is a amusement park attached with this complex and three fine restaurants, from where you can get local and international food to eat. 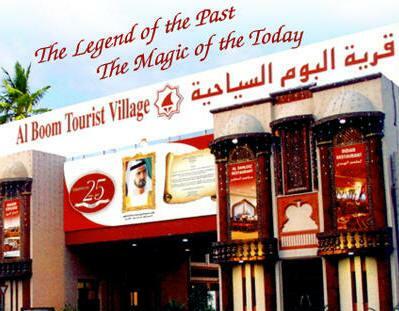 Al Boom Tourist Village was first of its kind, when it was opened more than two decades ago in Oud Metha, Dubai. Today there are numerous such complexes, but the height of popularity, which this site has touched, is hard to match. The success of this venue has pushed its owners to open some branches in other states of UAE too. This excellent complex comprises of four elegantly decorated banquet halls and three different restaurants. In addition to this, Al Boom Tourist Village also offers three cruises and catering services to the people of Dubai. Visitors will also find a coffee shop and a recreational area along with the banquet halls and bistros. Their banquet halls are open for the reservation of weddings, parties, conferences and meetings. Plus they can also set different kinds of arrangement, which includes Bedouin sitting and outdoor services. Enjoy fantastic cruises and see the sky scrapers constructed on the bank of Dubai Creek. Plus an open international buffet can also be relished on this cruise. The restaurants at this complex serve traditional local and Gulf region food along with several other international cuisines. Chefs of Al Boom Tourist Village’s restaurants are skilled and are well familiar with the art of cooking, therefore people come here from distant location and relish the lip smacking food. Through outdoor catering, Al Boom Tourist Village can make an arrangement for up to 10, 000 guests. They provide fresh and high quality food through this service. This complex opens on all seven days of the week from 8:00 am to 10:30 pm, between which people of Dubai can enjoy all the aforementioned activities. Oud Metha - Dubai - United Arab Emirates. Head east on 26th Street towards 13th Street, then go through one roundabout and make a slight right turn while staying on 26th Street. After that turn right onto Riyadh Road/D 81, before making a left turn, after which pedestrian has to turn left again in order to get to the destination on the left side. 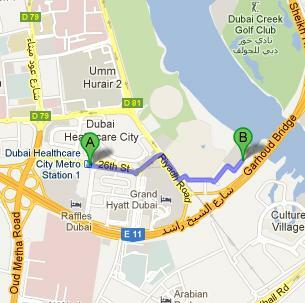 Creek Park Main Gate - Dubai bus stop is 1.4 kilometers away from Al Boom Tourist Village in Oud Metha, Dubai. This journey can be completed on foot in about 17 minutes, if a bus user heads southwest towards Riyadh Road/D 81, then continue straight onto Riyadh Road/D 81 and later turn left. After that bus user will make another left turn in order to locate the destination on the left side after covering some gap. Bus numbers 22, 42 and C7 serve this bus station. See the map for directions.